How to Change XP Start Menu into Windows 7 Menu easily : Start Menu in any Operating system plays an important role. We open many applications from it and perform various functions in this start menu. 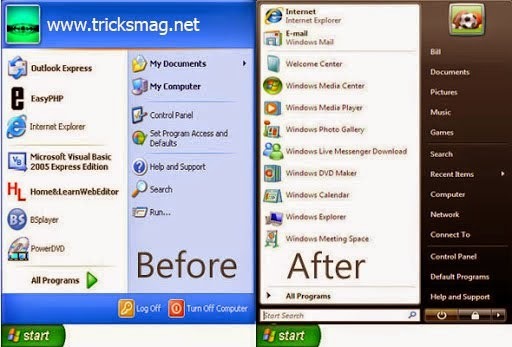 If you are running Windows XP in your PC and get bored from the old XP Start menu and want to change it into menu like Windows 7 then you can easily change it. See below. A software called ViStart allows you to customize the old blueish Windows XP Start menu unto Windows 7 menu. You can fully change the appearance of XP start menu into black menu with pretty search bar and along with many shortcuts.